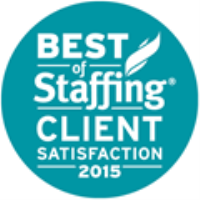 Cincinnati, OH – February 18, 2015 – BelFlex Staffing Network, a leading staffing agency in the light industrial industry announced today they have won Inavero’s Best of Staffing® Client Award for providing superior service to their clients. Presented in partnership with CareerBuilder, Inavero’s Best of Staffing Client winners have proven to be industry leaders in service quality based completely on the ratings given to them by their clients. With satisfaction scores more than three times higher than the industry average, award winners make up less than two percent of all staffing agencies in the U.S. and Canada who earned the Best of Staffing Award for service excellence. Focused on helping companies find the right people for their job openings, BelFlex Staffing Network received satisfaction scores of 9 or 10 out of 10 from 70 percent of their clients, significantly higher than the industry’s average of 32 percent. “Our company works hard to make service a priority and we are proud and honored to be recognized for our efforts in this way.” BelFlex Staffing Network President, Todd Cross said. BelFlex Staffing Network emerged in January 2014 as part of a rebranding of the rapidly growing Staffing Solutions Division of the Belcan Corporation. Tripling in size over the last four years, BelFlex Staffing Network is headquartered in Cincinnati, OH, and is a sister company to the Belcan Corporation. Driven by a core commitment that no one will work harder or smarter to help customers succeed, BelFlex Staffing Network provides innovative flexible staffing solutions to customers in the distribution, fulfilment and manufacturing sectors of the North American staffing market through 22 offices in the Midwest and Southeast. BelFlex Staffing Network employs more than 5,000 and generated revenues in excess of $125M in 2014.